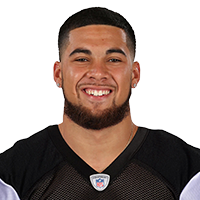 Goolsby (undisclosed) was cut from the injured reserve list by the Jaguars on Thursday, Daniel Popper of The Athletic reports. Analysis: The Florida product was placed on IR on Sept. 3 and has stayed there ever since. The extent of Goolsby's injury is unknown, but he is now free to sign with any team. Goolsby (undisclosed) cleared waivers and reverted to injured reserve, according to the league's official transaction log. Analysis: The nature of Goolsby's injury isn't clear, but the tight end is now stuck on IR through the end of the league year unless he agrees to an injury settlement. The Jaguars waived/injured Goolsby (undisclosed) on Saturday, Mike Kaye of First Coast News reports. Analysis: It's unclear what the undrafted rookie is dealing with, but he'll likely pass through waivers and revert to the Jags' injured reserve.